Included in M. fistulosa in Michigan Flora. 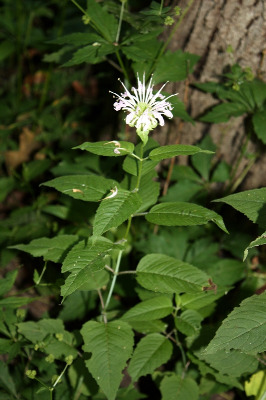 Known only from Warren Woods, Berrien Co., it grows in moist floodplain forests, a habitat quite different from the upland and mostly sunny sites of the similar M. fistulosa. The petioles of M. clinopodia are usually longer than those of M. fistulosa, the longest usually ca. 2–3.5 cm versus ca. 1–2.4 cm. Petioles of M. clinopodia typically have only sparse, spreading hairs, the longest more than 1 mm long, in M. fistulosa the petioles are usually finely and densely pubescent, sometimes with longer straight hairs, but these usually less than 1 mm long. Leaves are broader in M. clinopodia, ± ovate, and often wider than 4 cm; M. fistulosa usually has narrower leaves, rarely more than 4 cm wide. The flowers of M. clinopodia are paler, often nearly white, in contrast to the lavender flowers usual in M. fistulosa. MICHIGAN FLORA ONLINE. A. A. Reznicek, E. G. Voss, & B. S. Walters. February 2011. University of Michigan. Web. 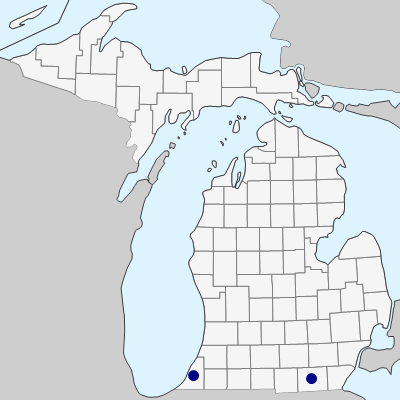 April 24, 2019. https://michiganflora.net/species.aspx?id=1572.